If you haven’t heard of peanut butter dumplings, you’re not alone. 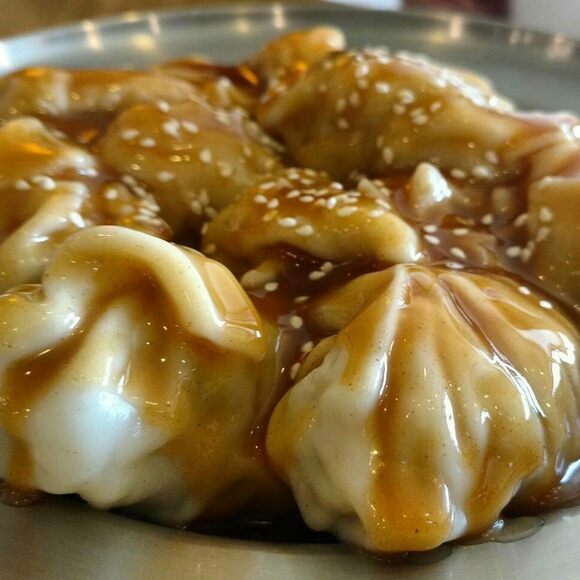 These steamed meat dumplings—topped with a sauce of peanut butter, soy sauce, Szechuan peppercorns, and sugar—hail from Montreal’s Chinese restaurants. While the dish has spread to other parts of Quebec, it largely remains a local specialty. Fans of the dumpling theorize that its lineage traces to similarly sauced Szechuan dumplings. The addition of Kraft-brand peanut butter (only available in Australia and Canada) was likely an adjustment to North American tastes. The result is a rich fusion specialty. According to Saveur, the first establishment to serve recognizable peanut butter dumplings was the long-closed Montreal restaurant Le Piment Rouge, where well-dressed waiters served peanut butter dumplings alongside expensive wine. These days, though, peanut butter dumplings are a more everyday specialty, and they are heavy enough to be welcome after a night of drinking. Peanut butter dumplings are sometimes known as Hunan dumplings. When dining outside Montreal, remember that "peanut sauce" is not the same as a peanut butter sauce. This Chinatown venue seves peanut butter dumplings. This long-running Chinese restaurant is famed for its peanut butter dumplings. These chocolate-covered peanuts got M&M's banned in Sweden.